Mike Taylor was born in Winchester, England. He studied at Southampton University, U.K. where he was awarded a Bachelors degree in Physics (1974), a Masters degree in Electronics (1997), and a Ph.D. in Atmospheric Physics (1986). From 1986-1990 he was a Senior Research Fellow in the Department of Physics at Southampton University and in 1991 he took up a research appointment at the Space Dynamics Laboratory and Physics Department at Utah State University. His primary research activities have focussed on the development and utilization of state-of-the-art CCD imaging instrumentation and digital analysis techniques for remote sensing studies of a range of upper atmospheric phenomena including mesospheric and thermospheric airglow emissions, acoustic-gravity waves, noctilucent clouds, equatorial and mid-latitude F region dynamics and faint, high-latitude aurora. More recently he has utilized these imaging systems to investigate the spectral and spatial signatures of upper atmospheric lightning phenomena termed "sprites" and "elves". 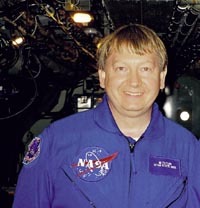 In 1998 he participated in ground-based measurements of the Leonids meteor shower from USA. He has published over 50 papers in these research areas. Currently he is Principal Investigator of a US-British Antarctic Survey program to investigate gravity wave climatology over Antarctica and has just initiated a collaborative program between several US and Japanese universities to investigate gravity waves and upper atmospheric lightning phenomena (both programs funded by the National Science Foundation). For the Leonid MAC campaign, Taylor made spectrally filtered measurements of meteors and trains at visible and near infrared wavelengths to investigate their signatures and dynamics. In addition he utilized the airborne instrumentation to make a novel imaging study of the longitudinal variability of the OH mesospheric airglow emission (peak altitude ~87 km) and to study atmospheric wave structure and source distributions. For the Hyperseed campaign, Taylor will study the near-IR emissions of the forebody radiation and wake using InGaAs cameras.